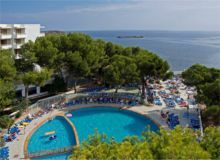 The friendly Azuline Coral Beach Hotel is in a superb position close to both the sandy beach of Es Cana and the pretty rugged cove of Cala Nova with its sweep of golden sand. A popular family hotel in a relaxed resort. 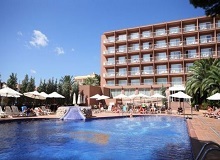 This hotel is perfectly situated on the magnificent beachfront of Es Cana, in a quiet area of Ibiza. The hotel provides an ideal venue for family holidays and within 500 metres guests will find countless shops, restaurants and bars.